If you’re a fan of Lewis Carroll’s Alice in Wonderland, then today is a rather special day – Mad Hatter Day! In some parts of the world (not any part I’ve ever lived in, but hey, I’ll take any chance for a bit of Carrollian fun! ), the 6th of October corresponds to 10/6 – the number on the Hatter’s iconic hat in the original John Tenniel illustrations to Lewis Carroll’s classic book. To celebrate today (and as a wonderful way to unwind after marking essays) I dug out my sketch book and pen, and sketched this quick little portrait of the Hatter. We’d better be quiet so as not to disturb him for he seems to have sipped a little too much from the “Drink Me” bottle, although fortunately as a consequence he’s now small enough to sleep it off in a teacup (like his friend the Dormouse) before nibbling his “Eat Me” cake to grow back to his normal size (should he fancy it – after all, what is normal in Wonderland?). This was a lot of fun to sketch, and I enjoyed incorporating elements of Tenniel’s famous depiction of the character (from both Alice in Wonderland and Through the Looking-Glass) with my own imagining of him. It’s become quite common to refer to our friend here as the Mad Hatter, but even though he is certainly associated with madness in the books, and the Cheshire Cat tells us he is mad (indeed that “we’re all mad here”), did you know that Carroll never actually used this phrase in the books himself? Instead, he is simply called “the Hatter”, and his madness speaks for itself. Another interesting fact is that the Hatter wasn’t part of the original tale told to the real Alice Liddell on that famous Oxford boating trip, and it didn’t appear in the hand-written and illustrated volume of the tale that Carroll made for Alice, entitled Alice’s Adventures Underground. The entire chapter “A Mad Tea-Party” was added later when Carroll revised and expanded his original tale for publication, and now this character has become one of the most memorable of the book! John Tenniel’s illustrations to the first published edition of Alice in Wonderland (1865) and its sequel Through the Looking-Glass (1871) have remained the most iconic, influential and immediately recognisable of all the many illustrations that have since been created and published. Tenniel was one of the most renowned Victorian artists, and he worked very closely with Lewis Carroll, who was extremely particular (to the point of being annoying!) about exactly how he wanted the illustrations to look. As a result, the illustrations are just as important as the text, and I believe they really do need to be considered together. So inseparable are the text and illustrations, that in a later younger children’s edition of Alice in Wonderland called The Nursery Alice (1890), Lewis Carroll explains the numbers 10/6 that Tenniel had drawn on the Hatter’s hat. He writes: “The Hatter used to carry about hats to sell: and even the one that he’s got on his head is meant to be sold. You see it’s got its price marked on it – a ’10’ and a ‘6’ – that means ‘ten shillings and sixpence.’ Wasn’t that a funny way of selling hats? And hasn’t he got a beautiful neck-tie on?” Below is the coloured version of Tenniel’s illustration that was used for The Nursery Alice. So there we go! Happy “Mad Hatter Day”! What do you enjoy about the “Mad” Hatter? Tell me in the comments below! *Quote from Martin Gardner’s The Annotated Alice: the Definitive Edition (London: Penguin Books, 2001). Mad Hatter is the excuse that we keep deep inside for the small acts of nice madness and cozy craziness that we keep cherishing from childhood and are afraid to reveal when we grow up. Everyone has that kind of Hatter that makes us funny, attractive, and, eventually – kind! 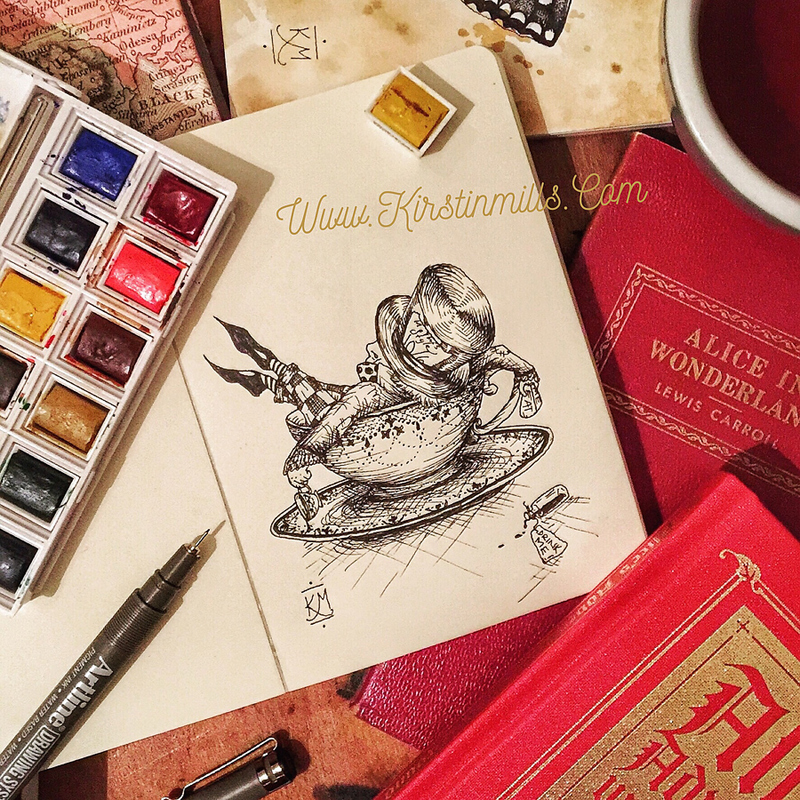 The sketch with the Hatter in a huge cup of tea does contain that state of indulging in the craziness of kind joy and relaxation after a cup of shared joy.